RNA polymerase (RNAP) is the enzyme which does transcription.The 2006 Nobel Prize in Chemistry was awarded to Roger D. Kornberg for creating detailed molecular images of RNA polymerase during various stages of the transcription process. Messenger RNA (mRNA). These are templates for the synthesis of proteins by ribosomes. Non-coding RNA or "RNA genes". These are a broad class of genes that encode RNA which is not translated into protein. The most important RNA genes are transfer RNA (tRNA) and ribosomal RNA (rRNA), both of which are involved in the process of translation. However, since the late 1990s, many new RNA genes have been found, and thus RNA genes may play a much more significant role than previously thought. RNA polymerase I synthesizes a pre-rRNA which will form the major RNA sections of the ribosome. 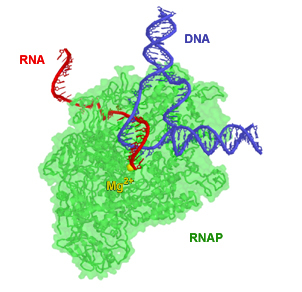 RNA polymerase II synthesizes precursors of mRNAs and most snRNA and microRNAs. This is the most studied type. It needs a range of transcription factors to bind it to promoters. RNA polymerase IV synthesizes siRNA in plants. Eukaryotic chloroplasts have an RNAP very similar to bacterial RNAP ("plastid-encoded polymerase"). Eukaryotic chloroplasts also have a second, unrelated, RNAP. Eukaryotic mitochondria contain an unrelated RNAP (member of the "single-subunit RNAP" protein family). X-ray crystallography of DNA and RNA polymerases show that, other than having a Mg2+ ion at the catalytic site, they are virtually unrelated to each other. So the two classes of enzyme have arisen independently twice in the early evolution of cells. One line led to the modern DNA polymerases and reverse transcriptases. The other line led to all modern cellular RNA polymerases. ↑ Lee Y. et al (2004). "MicroRNA genes are transcribed by RNA polymerase II". EMBO J. 23 (20): 4051–60. doi:10.1038/sj.emboj.7600385. PMC 524334. PMID 15372072. ↑ Willis IM. (1993). "RNA polymerase III. Genes, factors and transcriptional specificity". Eur J Biochem. 212 (1): 1–11. doi:10.1111/j.1432-1033.1993.tb17626.x. PMID 8444147. ↑ Herr A.J. et al (2005). "RNA polymerase IV directs silencing of endogenous DNA". Science 308 (5718): 118–20. doi:10.1126/science.1106910. PMID 15692015. ↑ Wierzbicki A.T. et al (2009). "RNA Polymerase V transcription guides ARGONAUTE4 to chromatin". Nat. Genet. 41 (5): 630–4. doi:10.1038/ng.365. PMC 2674513. PMID 19377477. This page was last changed on 3 April 2015, at 07:16.